This chapter outlines the current practices used in our laboratory for routine DNA barcode analyses of the three major marine macroalgal groups, viz., brown (Phaeophyceae), red (Rhodophyta), and green (Chlorophyta) algae, as well as for the microscopic diatoms (Bacillariophyta). We start with an outline of current streamlined field protocols, which facilitate the collection of substantial (hundreds to thousands) specimens during short (days to weeks) field excursions. We present the current high-throughput DNA extraction protocols, which can, nonetheless, be easily modified for manual molecular laboratory use. We are advocating a two-marker approach for the DNA barcoding of protists with each major lineage having a designated primary and secondary barcode marker of which one is always the LSU D2/D3 (divergent domains D2/D3 of the nuclear ribosomal large subunit DNA). 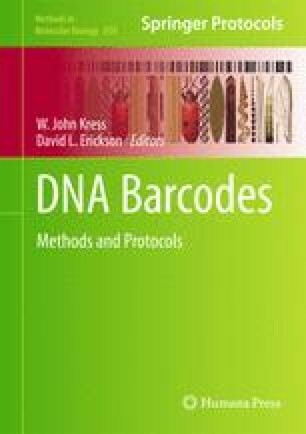 We provide a listing of the primers that we currently use in our laboratory for amplification of DNA barcode markers from the groups that we study: LSU D2/D3, which we advocate as a eukaryote-wide barcode marker to facilitate broad ecological and environmental surveys (secondary barcode marker in this capacity); COI-5P (the standard DNA barcode region of the mitochondrial cytochrome c oxidase 1 gene) as the primary barcode marker for brown and red algae; rbcL-3P (the 3′ region of the plastid large subunit of ribulose-l-5-bisphosphate carboxylase/oxygenase) as the primary barcode marker for diatoms; and tufA (plastid elongation factor Tu gene) as the primary barcode marker for chlorophytan green algae. We outline our polymerase chain reaction and DNA sequencing methodologies, which have been streamlined for efficiency and to reduce unnecessary cleaning steps. The combined information should provide a helpful guide to those seeking to complete barcode research on these and related “protistan” groups (the term protist is not used in a phylogenetic context; it is simply a catch-all term for the bulk of eukaryotic diversity, i.e., all lineages excluding animals, true fungi, and plants). Everyone who has worked in the Saunders laboratory since our digression into the realm of DNA barcoding is thanked for his/her contributions toward the overall objective of improved protocols, better primers, and preferred markers—it has truly been a group effort. This research was supported through funding to the Canadian Barcode of Life Network from Genome Canada through the Ontario Genomics Institute, NSERC, and other sponsors listed at www.BOLNET.ca. Additional support was provided by the Canada Research Chair Program, the Canada Foundation for Innovation, and the New Brunswick Innovation Foundation.